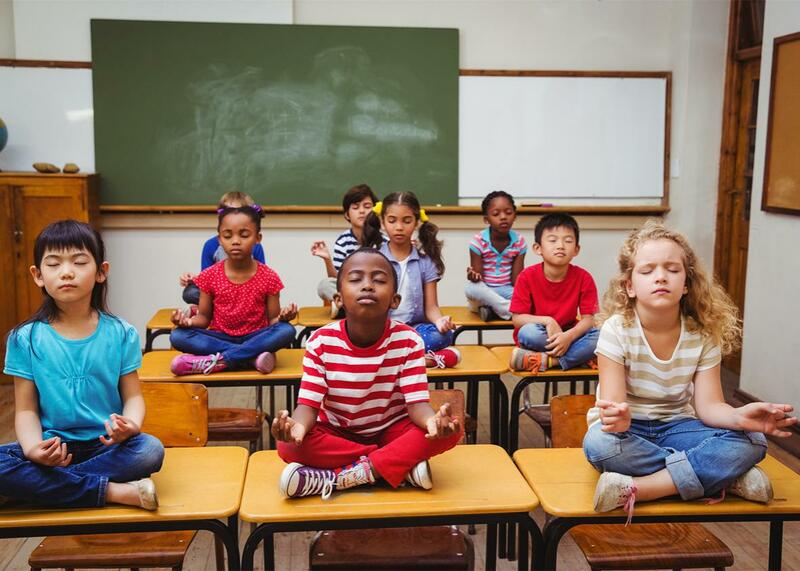 Teaching mindfulness meditation in schools: A skeptic’s investigation. Is the push to teach meditation in schools just a way to mold shiny corporate humanoids? A couple of months ago, I arrived early to pick up my son at preschool. A few of his classmates were acting especially rowdy that day, and their teacher was trying to calm them down before handing them over to their parents. She rang a little bell and said, “Deep breath, everyone.” They inhaled. They exhaled. It worked. In another time I wouldn’t have thought much of this. But these days, when meditation is increasingly being seen as way to gain a “competitive edge,” a deep breath isn’t always benign. Was my son being taught mindfulness? My colleague Michelle Goldberg has written about the way mindfulness meditation morphed from a spiritual to a self-help practice, one that businesses use to make workers more productive and boost profits. In recent years, schools have increasingly turned to mindfulness as well, in order to improve children’s behavior and ability to pay attention. When my son’s teacher instructed those children to breathe, it revealed to me just how inescapable the great mindfulness monster’s blubbery grip on our culture has become. I decided to look into how exactly schools are using mindfulness and whether I could free myself of the worry that this cult would shape my son into a shiny, corporation-ready humanoid. Mindfulness is a secularized approach to Buddhist meditation in which practitioners learn to observe their thoughts and feelings and, if things go according to plan, achieve more control over them. In order to teach children mindfulness, teachers will instruct their classroom to spend a short amount of time sitting quietly and observing their breath and the pitter-patter of their minds. Later, the children might share these observations with their classmates. Many mindfulness curriculums also include lessons on cultivating gratitude and appreciation of one’s senses; one popular method involves giving children two raisins and encouraging them to observe the differences between them—how they feel, smell, sound, and, eventually, taste. Because there is no single group or institution overseeing mindfulness in education, nobody knows exactly how many teachers have incorporated these techniques into their classrooms or how they’re doing it. The nonprofits MindUP and Mindful Schools say they’ve seen a steady increase in the number of teachers seeking their guidance in recent years; MindUP says it’s reached 500,000 students around the world over the last decade, and Mindful Schools says it reached 300,000 in the U.S. in the past five years. These groups—along with the dozen or so other curriculums from other mindfulness-in-education startups that have sprouted up in recent years—say that mindfulness is a useful tool for counteracting rising levels of anxiety and depression among children. A number of studies, albeit small and often advocate-funded ones, back them up. One of the largest to date looked at the effectiveness of the Mindful Schools program on around 400 low-income, mostly minority elementary-school students. It found that after five weeks of regular mindfulness sessions, teachers reported that students became more focused, participatory, and caring. Another study from the United Kingdom found improvements in the mental health of students enrolled in a mindfulness program. It’s fairly intuitive that a moment of quiet and reflection during the day would provide some benefit to stressed-out children. Still, I suspected that mindfulness was just a symptom of how we overprogram our kids, not a corrective to it. We should be subtracting things from our kids’ days before we start adding things in. Also, while some children might eagerly await an opportunity to observe their minds, others are bound to resist it. And another thing—what is the distinction between helping children to be “mindful” and simply getting them to sit still and behave? When I talked to experts, though, I realized that at least some of my skepticism is misplaced. “Mindfulness is a way to stop the bleeding, and sometimes a Band-Aid does help,” said Denise Pope, a senior lecturer at the Stanford University Graduate School of Education and co-author of Overloaded and Underprepared: Strategies for Stronger Schools and Healthy, Successful Kids. “This is something teachers can do immediately and isn’t that difficult to implement. You get a lot of bang for your buck, and anyone who is against it isn’t thinking clearly.” While Pope concedes that mindfulness does add yet another item to teachers’ and students’ endless to-do lists, it’s also something that teachers actually have control over, as opposed to extending recess or reducing standardized testing. Many advocates share my concern that mindfulness can provide cover for controlling or disciplining children rather than providing them with relief from stress. In the recent undercover video from the Success Academy charter school, a teacher angrily commands a first-grader to “Go to the calm-down chair and sit”; at one Baltimore high school, teachers can send disruptive students to the “Mindful Moment Room.” “Unfortunately, more schools are focusing on performance and grit rather than moral character,” said Vicki Zakrzewski, education director of University of California, Berkeley’s Greater Good Science Center. Zakrewski said that good programs balance the self-control side of mindfulness with its more prosocial aspects. So if one day my son comes home and tells me about the new mindfulness program at his school, I’ll be fine with it. Although the evidence on mindfulness remains relatively scant, there’s enough of it to suggest that some school-based meditation is far more likely to help my son than hurt him. Ultimately, I realized that it isn’t mindfulness that scares me but the way in which its promises resemble those of unstructured moments—how easy it would be to see mindfulness as a replacement for unscripted activities like resting, daydreaming, and improvisation. It’s not. No matter how my son responds to meditation, I’m going to make sure his day affords him enough free time to figure out whatever it is that will bring him feelings of calm or grace. Maybe it’s walking to the corner store with his dad. Maybe it’s sitting on my lap and watching the sky turn to night. Maybe it’s playing with Legos. Maybe it’s meditation. Providing him with a chance to discover it is something I promise to be mindful about.